WHITE COUNTY BOARD OF COMMISSIONERS WORK SESSION OF MONDAY, FEBRUARY 27, 2017 AT 4:30 P.M. CONDUCT A PUBLIC HEARING ASSOCIATED WITH THE APPLICATION SUBMITTED BY KENNETH R. GRIMES TO REDISTRICT 1.39 ACRES OF PROPERTY LOCATED ON FM ROAD CLEVELAND, GA TAX PARCEL # 003-045A FROM R-3 (RESIDENTIAL SEASONAL DISTRICT) TO R-1 (RESIDENTIAL SINGLE FAMILY DISTRICT). DISCUSS CONTINUATION OF THE AUTHORIZATION FOR THE WHITE COUNTY TAX COMMISSIONER’S OFFICE TO RECEIVE VARIOUS FORMS OF PAYMENT ON BEHALF OF WHITE COUNTY AND THE REVISED AUTHORITY TO DISBURSE FUNDS ON A MONTHLY BASIS TO THE WHITE COUNTY BOARD OF COMMISSIONERS OFFICE. DISCUSS BIDS RECEIVED FOR THE IMPROVEMENTS TO CAROLINA SPRINGS ROAD (ASSOCIATED WITH THE $358,501.00 RECEIVED IN COMMUNITY DEVELOPMENT BLOCK GRANT (CDBG) EMPLOYMENT INCENTIVE PROGRAM (EIP) FUNDING). DISCUSS THE PAVING OF BEAN CREEK ROAD, ASSOCIATED WITH THE CONTRACT PREVIOUSLY AWARDED TO CRUMLEY CREEK CONSTRUCTION @ $17,735.00 & STRATTON PAVING @ $27,816.00 (TOTAL SPLOST FUNDS ENCUMBERED OF $ $61,636.85 INCLUDING MATERIALS). DISCUSS BIDS RECEIVED FOR IMPROVEMENTS TO STANLEY NIX ROAD AND SAM CRAVEN ROAD. DISCUSS AMENDING THE WHITE COUNTY LAND USE ORDINANCE TO INCORPORATE A HISTORIC OVERLAY DISTRICT. DISCUSS CONCEPTUAL DRAWINGS AND COST ESTIMATES PROVIDED BY CARTER & SLOOPE ENGINEERING FOR THE YONAH PRESERVE RECREATIONAL FACILITIES. 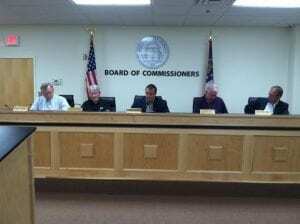 DISCUSS APPOINTMENTS TO THE WHITE COUNTY DEPARTMENT OF FAMILY AND CHILDREN SERVICES BOARD FOR CLARIFICATION OF TERMS. REVIEW THE AGENDA FOR THE MONDAY, MARCH 6, 2017 REGULAR MEETING.